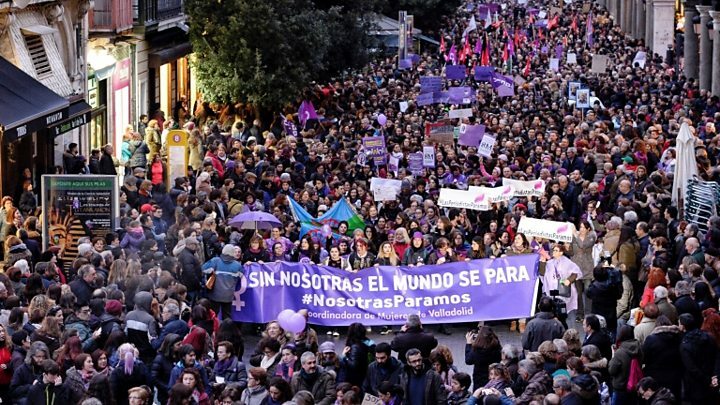 Women workers in Spain are marking International Women's Day with an unprecedented strike targeting gender inequality and sexual discrimination. Unions said 5.3 million women had joined the 24-hour strike, backed by 10 unions and some of Spain's top women politicians. Hundreds of thousands of women have joined street protests across Spain, shouting "if we stop, the world stops". Events marking the day are being held in dozens of other nations. Women taking part have stopped working and have been urged by organisers to spend no money and ditch any domestic chores for the day. Police were called to stop protesters blocking main roads in Barcelona but some women pickets still brought areas to a standstill. Public transport nationwide is available but at reduced services and flights have also been affected. Evening marches in Madrid, Barcelona, Bilbao, Valencia and a number of other cities are leading events in 200 Spanish locations. "I lived under the dictatorship, I lived under democracy and we haven't made much headway," teacher Concha Noverges told Reuters news agency as she stood on a picket line at a public school in Madrid. "A lot remains to be done and we, in the education sector, have a big role to play." Ana Reyes, a 37-year-old PR executive, told AFP news agency she was striking "in the hope that the importance of half of the population will be recognised and that it will bring about a real change". The 8 March Commission is behind the strike. Its manifesto calls for "a society free of sexist oppression, exploitation and violence" and says: "We do not accept worse working conditions, nor being paid less than men for the same work." A poll of 1,500 people for the El Pais daily suggested 82% supported the strike, while 76% thought women in Spain had harder lives than men. 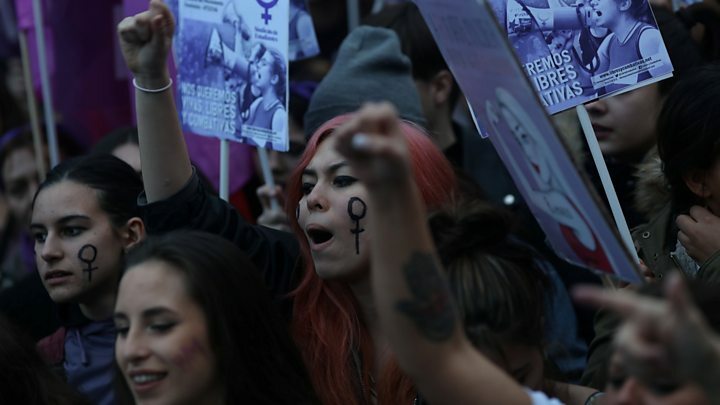 Feminist groups only want women to strike to show how important their absence is but Spanish law does not allow for single-gender strikes and men were welcome to support it. The two main unions had called for members to stop work for two hours in the morning. Some have opposed the strike. The ruling centre-right party, the Partido Popular (PP), said the action was "for feminist elites and not real women with everyday problems". Two of the five female ministers in Spain's conservative government, Agriculture Minister Isabel García Teresina and the president of the Madrid region, Cristina Cifuentes, said they would work longer hours to show the capacity of women. But well-known female presenters were absent from TV screens and radio airwaves. Actress Penelope Cruz cancelled planned public events and said she would go on "domestic" strike. The mayors of Madrid and Barcelona - Manuela Carmena and Ada Colau - are also backing the strike. But the National Federation of Self-Employed Workers told El Pais that self-employed women remained overwhelmingly at work. In Spain, women were paid 13% and 19% less than men in the public and private sectors respectively, data from the European Union's statistical provider Eurostat said. What's happening elsewhere in the world? A group of prominent Catholic women met in Rome to demand a greater say in Church governance. But the list of speakers angered the Church and Pope Francis has declined to attend or celebrate Mass. A former president of Ireland, Mary McAleese, described the Catholic Church as an "empire of misogyny"
While leaders across Africa praised the role of women, the government in Ivory Coast decided to update a list of jobs that women are banned from doing. The labour laws now preclude "work that exceeds the ability and physical capacity of women, or work that presents dangers which is likely to undermine their morality, for example, working underground or in the mines".